Do you crave something sweet in the mornings? Are jelly-filled donuts or raspberry scones your weakness? Well, I have the recipe for you. It’s whole grain and full of fiber and has about half the calories and sugars as a muffin or donut from your local coffee shop (or worse– gas station). Make these ahead of time and grab one on your way out the door in the morning along with a piece of fruit or a yogurt. It will save you time, money and your body will thank you for it! Because of the fiber in these muffins, you won’t experience that 10am sugar crash. 1. Preheat oven to 375 degrees. Line muffin tin with baking cups or spray with nonstick cooking spray. 2. In a medium bowl, stir together all flour, oats, sugar, baking powder, almonds, zest and salt. Make a well in the middle of the dry mixture. 3. In a smaller bowl, combine the egg, milk, and yogurt spread. Pour the liquid mixture into the center of the flour mixture. Stir just until moistened. 4. Spoon batter evenly among muffin cups. 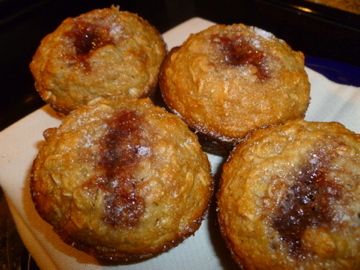 Spoon 1 teaspoon of raspberry preserves in top of the batter of each muffin. Bake until tops are lightly browned, 15- 20 minutes. Let cool for 5-10 minutes, then sprinkle very lightly with sugar on top if desired. **Brummel and Brown yogurt spread is what I use instead of butter. It’s just a lower fat version of a spread that doesn’t have a gross aftertaste or mouthfeel that some of them do. You can brown in the skillet or just melt in the microwave for this recipe. Bonus tip- You can also try replacing the fat or oil in any baking recipe with unsweetened applesauce or pumpkin puree for a boost in vitamins and antioxidants. I was out of applesauce, but I’m sure it would go great with these muffins. 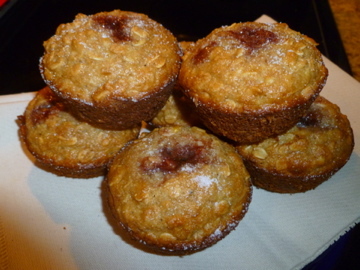 So delicious… sometimes you can have your muffins and eat them too!